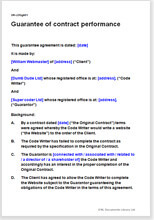 Simple agreement where guarantor steps in to guarantee performance of any contract. Example contractor has problems; other party refuses payment or threatens to sue. Guarantor "rescues" first party by guaranteeing performance of the contract. Original contract is referenced, so remains unchanged. Applicable to any situation. Very easy way to record re-arrangement of a deal. This is a professionally drawn, short agreement which identifies an original contract, then ties a new guarantor to it, to stand in the shoes of one of the parties. This contract guarantee covers any situation where there has been some disagreement about a contractor's ability to complete his performance obligations. A new deal is agreed, whereby the contractor finds some other company to provide support and guarantee the performance of the contract. Although named a guarantee document, we have also provided a structure for you to add changes to the terms of the original agreement. These could be changes to price, payment terms, completion date, penalties, quality of work, testing, or anything else. Nineteen year old builder agrees to build a garage. Problems arise in quality of work. Client holds back money. Client accepts his father (also a builder) as guarantor and garage is completed. Internet marketer takes on work for small company. Company fails to complete website so marketer cannot complete the task. Directors of company personally guarantee that the website will be completed, so marketer agrees not to sue the company for breach of contract. Civil engineering company engaged in public works contract falls behind in milestones to complete new motorway. Department of Transport threaten penalty clause. But just in time, parent company agrees to guarantee the performance of the contract, including the penalty provisions. There is no modern statutory law relating to guarantees. This document is based on contract common law. In these examples, the guarantee is for performance of a contract. If you are looking for a guarantee agreement for a contract debt only, look at Guarantee of contract debt OR Deed of guarantee of loan. Net Lawman offers other document templates related to new guarantees at Guarantees and Indemnities. This document was written by an attorney for Net Lawman. It complies with current South African law. *How can we help you regarding this document? Please tick the box to confirm that you are a human being. "The website is great, the access easy, documents professional. All very smart. Immediately got a good impression of Net Lawman." "I have found the product exactly what I wanted and the notes helpful - as well as it being easy to locate, buy and download. There should be a better way of making your product more widely known. I have recently had experience of a tailor-made lease and this left a lot to be desired - whereas your product is well researched and ticks all the boxes." "Yes the document was very useful, easy to read and understand and contained everything I needed. I will definitely refer to your site in the future."